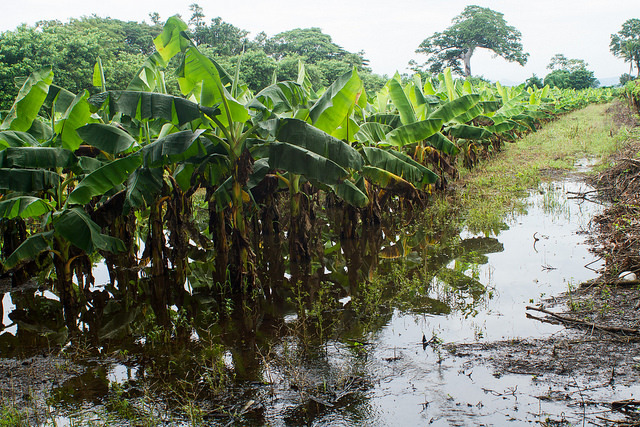 SAN SALVADOR, Nov 2 2018 (IPS) - Disconsolate, Alberto Flores piles up on the edge of a road the few bunches of plantains that he managed to save from a crop spoiled by heavy rains that completely flooded his farm in central El Salvador. “Everything was lost, I have been cutting what can be salvaged, standing in water up to my knees,” said Flores, a 54-year-old peasant farmer from San Marcos Jiboa, a village in the municipality of San Luis Talpa, in the south-central department of La Paz. Flores told IPS that as a result of the rains, which hit El Salvador and the rest of Central America in mid-October, he lost some 2,000 dollars, after nearly a hectare of his plantain (cooking bananas) crop was flooded. San Marcos Jiboa is a rural community of 250 families, 90 percent of whom are dedicated to agriculture. Most of the local farming families were affected by the torrential rains, IPS found during a tour of the area. The damage was mainly to chili peppers, maize, beans, bananas, pipián – similar to zucchini – and loroco (Fernaldia pandurata), a creeper whose flower is edible and widely used in the local diet. Other parts of the country and the Central American region were also hit hard. Central America has been described in reports by international organisations as one of the planet’s most vulnerable regions to the onslaught of climate change. And yet, tools that help farmers mitigate weather shocks, such as agricultural insurance, are not widely available in Central America, although important initiatives have been launched. 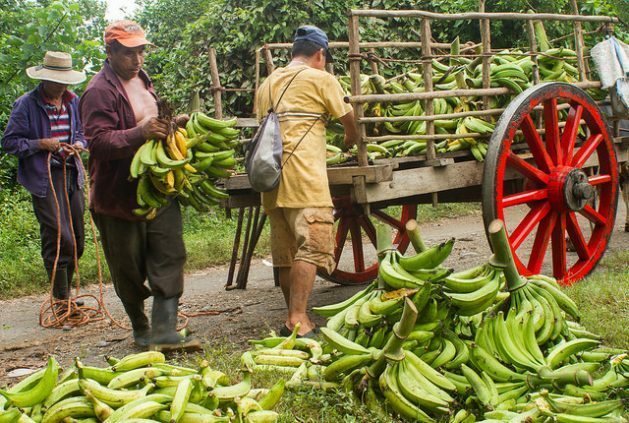 “I’ve heard about agricultural insurance, but no one comes to explain what it’s about,” said Flores, who perspires heavily as he piles up clusters of green plantains. Compared to Mexico or countries in South America, Central America has made little progress in this area, according to the report Agricultural Insurance in the Americas, published in 2015 by the Inter-American Institute for Cooperation on Agriculture (IICA). The report states that the efforts made in the region have not generated the expected results, although it cites a growth in agricultural insurance premiums in Guatemala, where they totalled 2.25 million dollars, followed by Panama (1.8 million) and Costa Rica (just over 500,000 dollars), according to data from 2013. Experts pointed out that the high cost of agricultural insurance premiums, which is about 13 percent of an agricultural loan or investment, is one of the reasons, as well as a lack of information on and culture of using insurance. “Basically, it’s expensive,” Saúl Ortiz, Guate Invierte’s Risk Analysis and Management Coordinator, told IPS by telephone from Guatemala. The financial institution manages a trust fund of more than 70 million dollars in agricultural support in various areas, including insurance. It is precisely because of these costs that Guate Invierte emerged in 2005, added Ortiz, to support the country’s small and medium producers and give them the chance to take out a policy. The initial plan was to extend it throughout the region. In addition to being a state guarantor of agricultural credits acquired by farmers from other financial institutions, Guate Invierte offered insurance not linked to loans, with a subsidy of up to 70 percent of the cost of the premium. "Climate change definitely has consequences for production and for people's livelihoods, especially those who depend on agriculture," FAO consultant in El Salvador Mariano Peñate told IPS. The soil is deteriorating and the livelihoods, especially of the poor, are being hit hard because of the impact on the yields of their small-scale crops, and indirectly, due to the reduction of employment, he said. That affects food security, he added, not only of the population affected by these climatic phenomena, but also of the people who depend on the crops grown in the affected areas. "We must consider the protection of agriculture and how that improves food security, and to this end we must work on prevention measures that make productive systems more resilient and that generate sustainable development," he said. But that scheme failed because the government stopped injecting funds, and in 2015 Guate Invierte ceased to offer subsidised insurance not linked to loans, although it maintains coverage for customers who do have loans. In El Salvador, while there is not a consolidated market, one kind of policy aimed at small farmers has begun to operate. In July, Seguros Futuro, together with the state-run Agricultural Development Bank, launched the Produce Seguro programme, with coverage for earthquakes, droughts and excessive rainfall. It is a microinsurance scheme aimed at the bank’s portfolio of 50,000 clients, whether they are farmers or involved in other productive sectors. Unlike traditional insurance policies, which in the event of a catastrophe only pay for physically verified crop losses, Produce Seguro offers “parametric” insurance. This kind of insurance pays a set amount for a specific event, based on the magnitude of the disaster, such as an earthquake or flooding, as measured y satellite and other advanced technology which indicates, for example, the level of rainfall in a given area. The higher the level of rainfall in the policyholder’s area, the higher the indemnity. In the case of rainfall, the initial level is 136 mm of water accumulated over three days. The information comes from the U.S. National Aeronautics and Space Administration (NASA) and the Salvadoran Ministry of Environment and Natural Resources. “We don’t have to do any verification in the area, everything is based on the charts,” Daysi Rosales, general manager of Seguros Futuro, told IPS. The pilot programme is supported by Swiss Re, the Swiss reinsurance company. The cost of premiums is five percent of the credit contracted with the BFA, which is affordable to farmers. As a result of the last downpours, “the parameters have already been met and some level of compensation will be made, although we haven’t paid yet because the event just occurred and we are processing the payments,” said Rosales. Rosales and Ortiz concur that state participation has been key to the expansion of agricultural insurance in South American countries or Mexico, something that has not happened in Central America. “In Mexico, 90 percent is paid by the State; it is the State that buys the insurance, not the people,” said Rosales. Meanwhile, on one of the flooded plots of land in San Marcos Jiboa, Víctor Alcántara, another farmer who was affected by the rains, said the impacts of natural disasters are felt virtually every year in this country, where climate change has become more severe this century. “This time the blow was twofold: first we lost our maize in August, to drought, and now I’ve lost almost my whole loroco crop because of the rain,” he added. Alcántara said he had invested 300 dollars in planting loroco, and has lost 60 percent of the crop due to the heavy rains. Added to this is the loss of half a hectare of maize, worth around 400 dollars, due to the drought that affected the area in August, in the middle of the May to November rainy season, which is when the two annual harvests take place. In August, the United Nations Food and Agriculture Organisation and the World Food Programme warned in a joint statement that the drought would impact the price of food, since maize and beans, basic to the Central American diet, have been the most affected crops. Guatemala, El Salvador and Honduras reported losses of 281,000 hectares of these crops, on which the food security and nutrition of 2.1 million people depend, the report said. Now that his maize harvest is ruined, Alcantara said he will have to figure out how to put tortillas on his family’s table. My wife is a US citizen who was born in El Salvador! A lot of flooding here (We have a home there)is the peoples own fault!They throw their trash and garbage in the road ditches,rivers,etc. where they plug the drainage and flood surrounding communities!It is this way in a lot of Central America!Even Costa Rica has a lot of trash in their rivers! Trinity – while trash is an issue in many parts of Central America, that has nothing to do with drought or too much rain. I’ve done humanitarian work in Nicaragua, and am actively engaged in a farming operation in the USA. If it doesn’t rain or rains too much the result is often the same–a ruined crop. Trash has nothing to do with that.